Coffee is known to be one of the most popular beverages in the world, but still around every corner you hear the most bizarre myths about it! Sit back, sip at your coffee, relax and see if you agree…. If this was true… sitting out on the deck overlooking the ocean on that beach vacation … sipping a cappuccino… would make you edgy and tense! Sorry to burst your stress bubble… but coffee does not cause stress, and in fact, many of us turn to it when we are stressed as a “treat”… something to enjoy and relax with. BUSTED! Sure… if you drink 10 cups of espresso in 3 minutes… but definitely not if you drink 2-3 cups daily. After one has consumed a cup of coffee, caffeine is processed through the liver where almost 50% is flushed out of the body within 4 hours and the Mayo Clinic states that “up to 400 milligrams (mg) of caffeine a day appears to be safe for most healthy adults. That’s roughly the amount of caffeine in four cups of brewed coffee”. BUSTED! Only if you believe aliens control Donald Trump! Er… ok… maybe not the best analogy … lets try “Only if you believe State Capture is a myth!” According to research, coffee contains antioxidants which assist in fighting cancer. So go ahead … press the button on your coffee machine and kick start each day with your favourite blend! BUSTED! Where do people come up with this stuff? Busted! Coffee contains beneficial antioxidants which promotes a healthy heart, fights cancer, and assists in reversing the effects of aging, allowing you to postpone those laughter lines for just a little while longer. BUSTED! Myth 5: Coffee transforms you into an addict? Allow us to educate ourselves… addiction is when a person intensely depends on a drug with serious withdrawal symptoms. So unless you get a crazed look on your face when the coffee machines are all broken, you are not an addict. Er… hang on a second… this could be plausible! PLAUSIBLE! 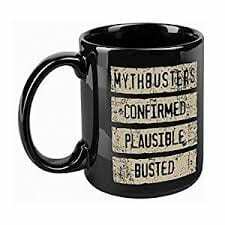 Myth 6: Coffee or a child? This is a cruel myth which we discard immediately! Research has proven that coffee will not cause you to miscarry, be infertile, or that your baby will be born with a low birth weight. We all know a coffee drinker blessed with beautiful children (hopefully you!). BUSTED! How lucky to be in a world where every second person is a doctor! But please, while you are busy diagnosing illnesses, please note that a lack of calcium and vitamin D in one’s diet is a leading cause of osteoporosis, along with other factors such as: a lack of physical activity, smoking, low body weight, menopause, a high protein diet and low estrogen levels. BUSTED! Myths busted!! Well…. maybe one is plausible and maybe I am a coffee addict… but I wouldn’t want it any other way! Would you?